Let’s continue talk about concrete types, because there is more! This is, as you may say, regular way to do and finish a concrete. Of course, there is a smooth finish, but broom finished provides a high-traction surface and better drainage (note, broom marks should always be running towards the drain). However, if you don’t care about drainage, you can create decorative effects by running the broom texture in various directions. Concrete doesn’t have to be grey. 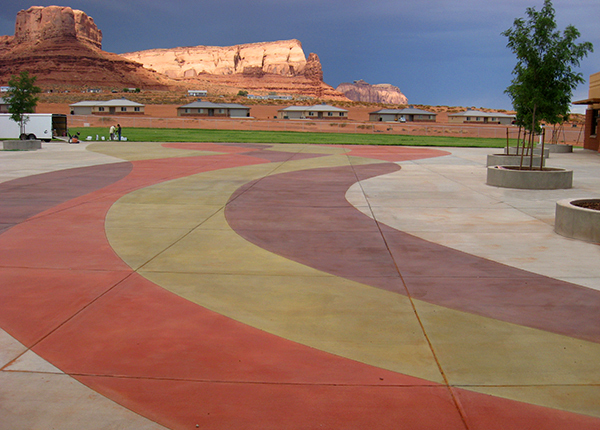 They are so many different colors and products to color concrete – it is amazing. Colored concrete cost more than plain grey, but it worth an investment. Prices are not crazy-biting, but the result will look wonderful. It can help your concrete patio or walkway to match your overall design. Some of the products can be used on existing concrete too, which is a great news, if you don’t want to install new concrete element, instead of the old one. So how concrete gets colored? Color for the concrete is not a paint, dye or stain; it is pigments. Pigments are available in powder, liquid or granular forms. Iron oxide pigment particles are 10 times smaller than a particle of the cement. When color pigment is added to the cement based mix, the smaller pigment particles cover the larger cement particle.